This morning’s ceremony will be a dream come true for Helen Savage from Portaferry, Co Down. 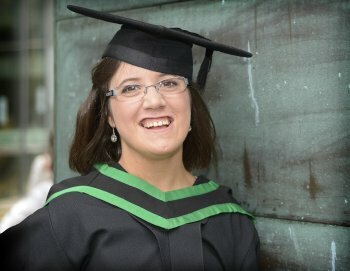 As well as graduating with a BSc Hons Social Policy, Helen, who suffers from a mild form of cerebral palsy, has won the George Mitchell Memorial Prize, awarded annually for the most outstanding dissertation, which will also be presented to her today. Helen said: “I was born with mild cerebral palsy, which means I take longer to complete tasks and compared to my peers, I tire more quickly. “I’ve always dreamed about graduating from university andhaven’t let my disability stop me from achieving my goals. “I could not fault the support offered by the University of Ulster. From day one, the support has been invaluable. I had classroom assistance throughout secondary school, so starting university was a daunting experience. “However, with the help of Student Support Services, it became an enjoyable one not onlyacademically,but alsosocially. “The support offered by the University of Ulster, has meant my experience has been a happy one and has helped me achieve my goal of obtaining my degree. “I am delighted to also receive the George Mitchell Memorial Prize. My dissertation aimed to identify the main barriers which carers face and also to explore what support is in place for carers in helping them to fulfill their caring role. “I have always wanted to work with people and have a career which would make a difference to people's lives. When I was in upper sixth and applying for courses for university, social policyat the University of Ulster appealed to me asit covered all the areas I was interested in such as health inequalities, children and families, and disabled people. “I have had a wonderful three years of university life, have met lots of new people and have really enjoyed the social aspect of university.